Kid 1 has ‘a moustache theory’. He believes that anyone with a ‘mo’, immediately feels more confident and intimidating than someone without one. Gunna go grow me one…. Until then, the baking goes on, regardless of an outstanding insufficiency of facial hair. 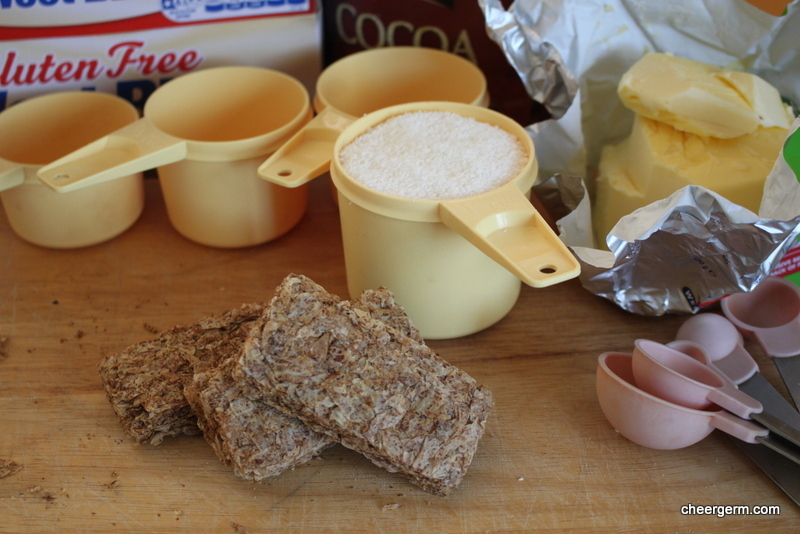 My standard weetbix slice uses a creamed butter method but sometimes, you just can’t be arsed bothered with all that malarkey. 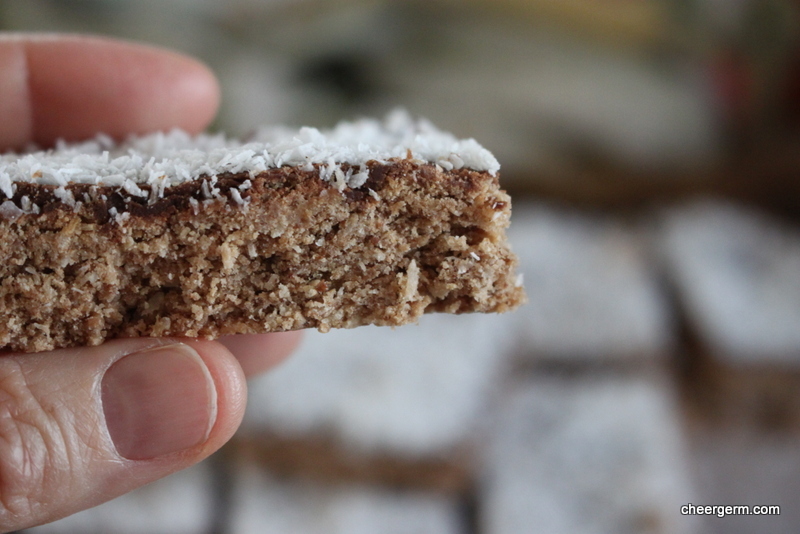 So a melt and mix slice was required, I had been wanting to use gluten free weetbix for a wee while now. (The Yak was a very happy little coeliac when a certain company started producing these iconic baked breakfast bricks using gluten free sorghum flakes.) This recipe works a treat and is nice and quick. All of you wheat tolerant out there may be thinking, big whoop. Our Yak is no cry baby and as we all know, far worse things happen than being a coeliac. It’s just that every now and again, he wants to eat something that is as delicious as the original memory of a dish ever was. This is one of those dishes. Preheat the oven to 180C (170C fan-forced) and line a 26cm X 18 cm tin with baking paper. 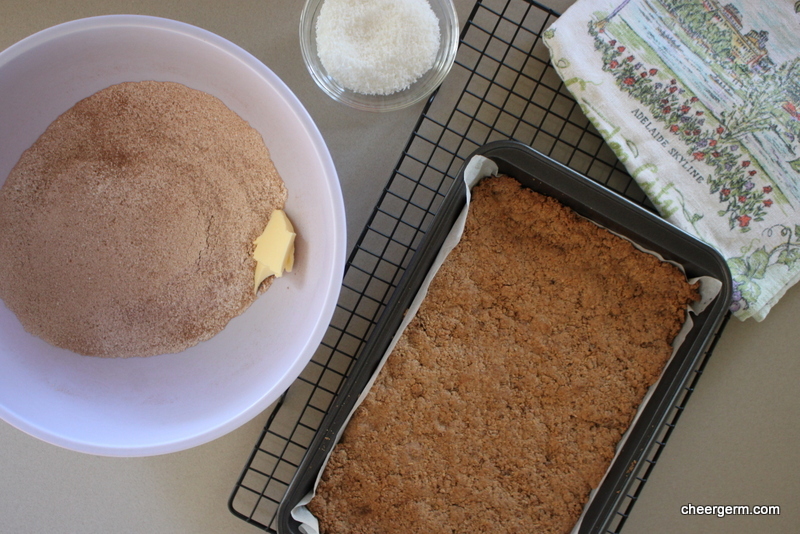 Crumble the weetbix finely into a large bowl. Sift over the flour and cocoa. 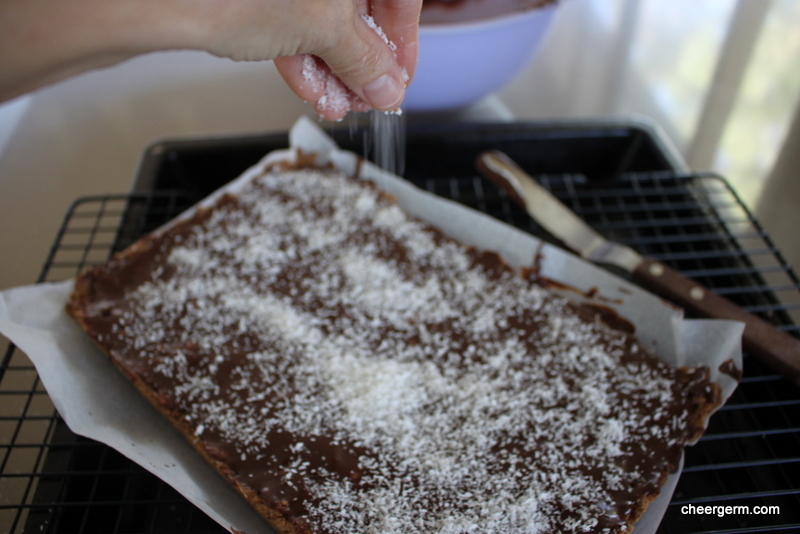 Stir through the sugar and coconut until all ingredients are combined. Add the butter and stir then add the milk and stir again until well combined. Spoon the mixture into the prepared tin and press down firmly (I use my fingers). Sift icing sugar and cocoa together into a medium sized bowl. Add the butter then the hot water and stir until runny. Pour the icing over the cooled slice and spread. 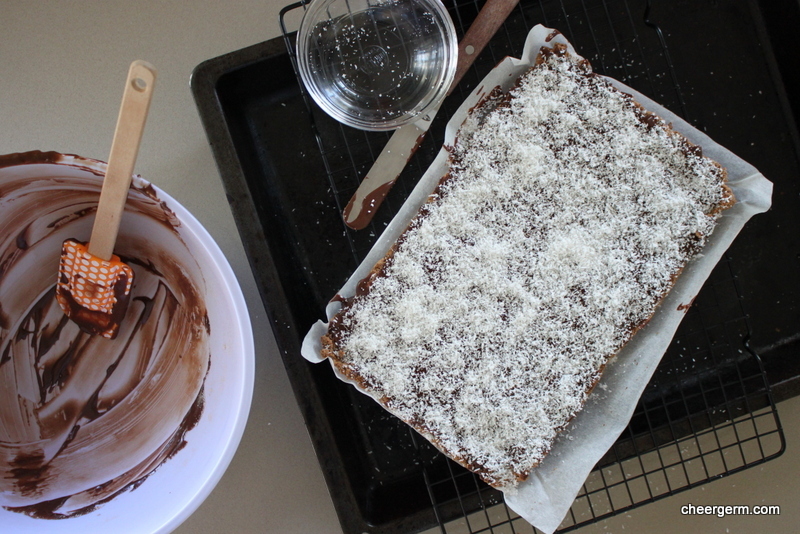 Sprinkle the coconut over immediately. Let the icing set then cut the slice into squares. A Cheergerm adaptation of a recipe from the Best Recipes website. Link follows. Footnote: (Or is that ‘thumbnote?) My wrinkly thumb has somewhat of a starring role in these photos, deepest apologies. 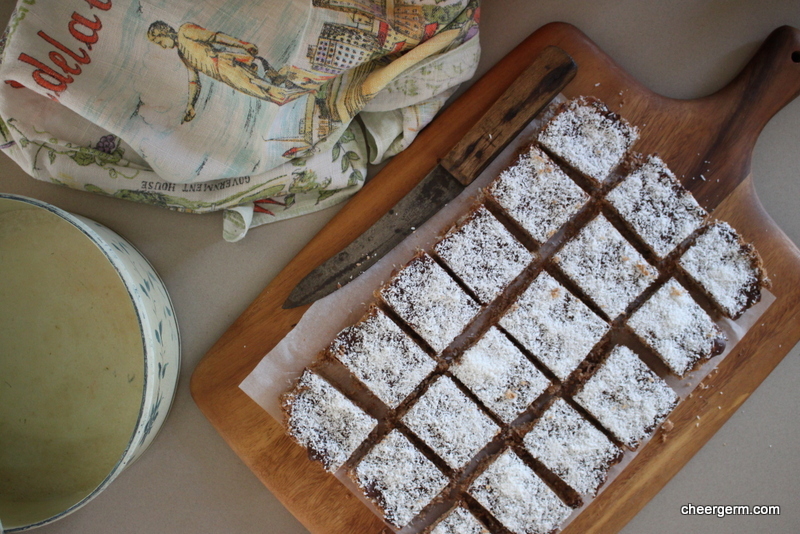 This entry was posted in Family memories, Gluten free baking and desserts and tagged baking, cheergerm, chocolate, coeliac, Cooking, food, gluten free, gluten free weet-bix, recipes, Weet-bix slice. Bookmark the permalink. Not sure about your son’s facial hair theory (never been partial to a stache), but this post intrigued me to look up ‘Weetbix’ vs. ‘Weetabix’. Very strange that the product was in invented in Australia but the company changed the name for the rest of the world. Any-hoo, who really cares, when it turns out such delicious things can be done, whatever it’s called? May the Yak enjoy! Exactly! All the advertising centred around muscular sporting types who ate (gasp!) three Weetabix instead of the usual two. The Weetabix biscuits were a good bit larger than the current Weetbix ones, so this isn’t quite as unexciting as it sounds. 3 Bix was quite a big ask! It’s quite ironic isn’t it! I guess ‘sorghum-bix’ just didn’t have the same ring to it? 😂 I think my Nana used to make it as well as Mum. It’s such a comforting and lovely thought that we are all connected by food generationally. As well as getting to meet in the blogosphere and share our our foodie pasts, presents and futures. I have seen shredded wheat and they are looked less flaky and more, well, shredded. (Hence the name? Lol…) The LSH is spot on. 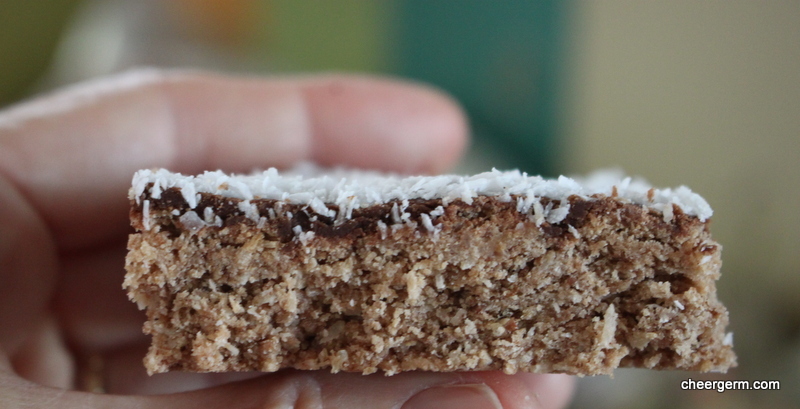 This slice is so delicous with the butter, coconut, cocoa and sugar; that you can convince yourself that the wholegrain goodness makes up for it all! Glad you appreciate my old tea towels LM, love, love collecting them. The feel, the look, oh my. They don’t look “old.” You must take good care of them! I love the funny things children say when they’re being serious. Yes, they are certainly a constant source of entertainment! 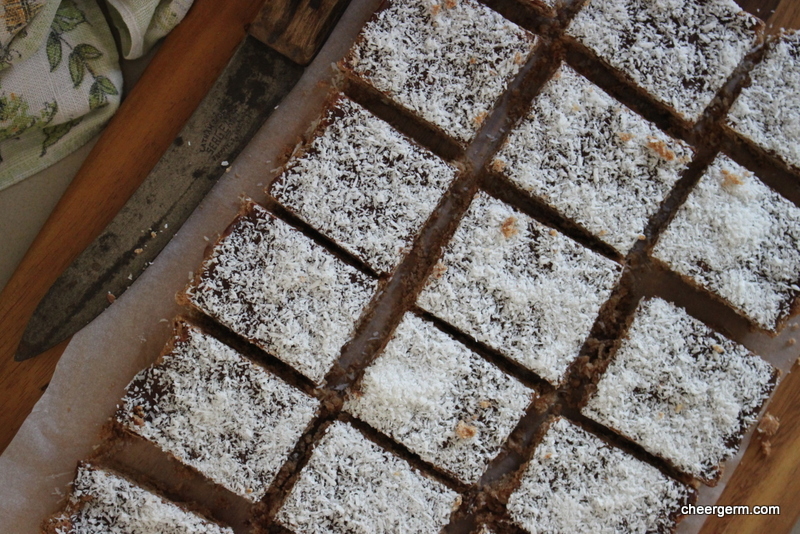 The good old fashioned chocolate slice. 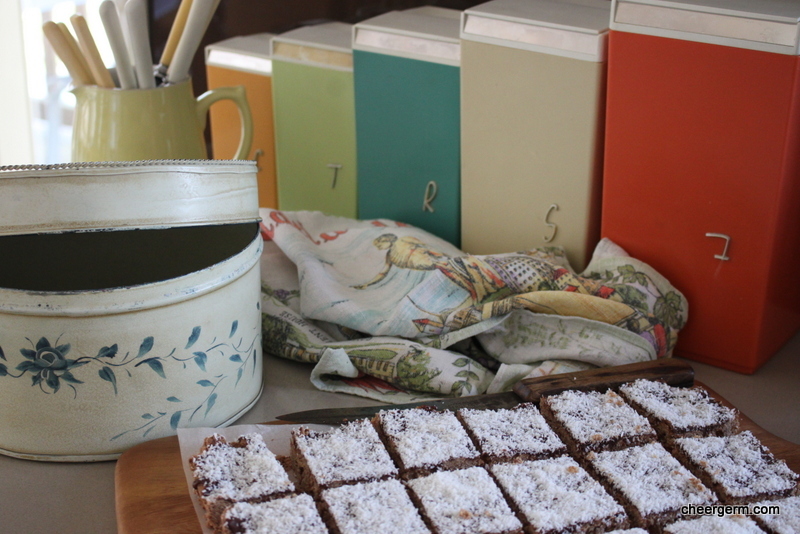 Nice that you included all the retro decor with your first photo Lisa as this stuff was all in vogue when my Mum used to make this slice- well she probably is still making it. It all just seemed to look good together, not much fussing around, probably because they were the same era! Been round for a long time this kind of slice hey? Pretty neat that it’s part of our collective food memory. I thought of you the other day in the health food shop when I saw the range of sulphur free, organic edible coconut products. Not sure if you would be able to use them or not? Yes, I could use those indeed. I shaved my ‘tash’ a few years ago. Youngest daughter hasn’t forgiven me for doing that. It was red when shaved. It’s white now. I have no ‘presence’. Maybe your lass and my son are privy to some ‘secret tash knowledge’ that has eluded many of us? Thanks Conor! Kid 1 has an interesting point, I wonder if he’s open to giving a few folks a quick survey. Ask him what he thinks about moustache vs. full beard and then moustache vs. moustache with goatee.